When the sun is peeking through the window, make sure your little one is wrapped in a Morning Light Baby Blanket. This easy crochet baby blanket uses just one skein of soft yellow yarn to create a beautiful lacy crochet blanket. Finished with a lace crochet edging and a ribbon, this crochet baby afghan will become a child's favorite. Work this up in your child's favorite colors or in a hue to match your nursery, or just stick with a simple pastel, as shown. Whatever color you decide to use, you can't go wrong! MEASUREMENTS: 36 ins [91.5 cm] square. 5 yds [4.5 m] of ? inch [9 mm] wide ribbon. Foundation row: (WS). 1 dc in 4th ch from hook (counts as 2 dc). 1 dc in each of next 2 ch. Ch 3. Miss next 4 ch. (1 dc in each of next 7 ch. Ch 3. Miss next 4 ch) 10 times. 1 dc in each of next 4 ch. Turn. 1st row: Ch 3 (counts as dc). 1 dc in each of next 2 dc. Ch 2. [(Yoh and draw up a loop. Yoh and draw through 2 loops on hook) 3 times. Yoh and draw through all loops on hook - CL made. Ch 2] twice in next ch-3 sp. [Miss next dc. 1 dc in each of next 5 dc. Ch 2. (CL. Ch 2) twice in next ch-3 sp] 10 times. Miss next dc. 1 dc in each of next 2 dc. 1 dc in top of turning ch 3. Turn. 2nd row: Ch 3 (counts as dc). 1 dc in next dc. Ch 2. CL in next CL. Ch 2. CL in next ch-2 sp. Ch 2. CL in next CL. Ch 2. (Miss next dc. 1 dc in each of next 3 dc. Ch 2. CL in next CL. Ch 2. CL in next ch-2 sp. Ch 2. CL in next CL. Ch 2) 10 times. Miss next dc. 1 dc in next dc. 1 dc in top of turning ch 3. Turn. 3rd row: Ch 5 (counts as dc and ch 2). 1 dc in next CL. (2 dc in next ch- 2 sp. 1 dc in next CL) twice. [Ch 3. Miss next 3 dc. 1 dc in next CL. (2 dc in next ch-2 sp. 1 dc in next CL) twice] 10 times. Ch 2. Miss next dc. 1 dc in top of turning ch 3. Turn. 4th row: Ch 4 (counts as dc and ch 1). CL in next ch-2 sp. Ch 2. Miss next dc. 1 dc in each of next 5 dc. Ch 2. [(CL. Ch 2) twice in next ch-3 sp. Miss next dc. 1 dc in each of next 5 dc. Ch 2] 10 times. CL in 4th ch of turning ch 5. Ch 1. 1 dc in 3rd ch of turning ch 5. Turn. 5th row: Ch 4 (counts as tr). 1 tr in next ch-1 sp. Ch 2. CL in next CL. Ch 2. Miss next dc. 1 dc in each of next 3 dc. Ch 2. (CL in next CL. Ch 2. CL in next ch-2 sp. Ch 2. CL in next CL. Ch 2. Miss next dc. 1 dc in each of next 3 dc. Ch 2) 10 times. CL in next CL. Ch 2. 1 tr in 4th ch of turning ch 4. 1 tr in 3rd ch of turning ch 4. Turn. 6th row: Ch 4 (counts as tr). 2 dc in next ch-2 sp. *1 dc in next CL. Ch 3. Miss next 3 dc. 1 dc in next CL. [(2 dc in next ch-2 sp. 1 dc in next CL) twice. Ch 3. Miss next 3 dc] 10 times. 1 dc in last CL. 2 dc in next ch-2 sp. Miss next tr. 1 tr in top of turning ch 4. Turn. Rep 1st to 6th rows 8 times more, ending with RS facing for next row. 1st rnd: Ch 1. 2 sc in first dc. *Work 123 sc along each side of Blanket and 3 sc in corners. Place marker on 2nd sc of 3 sc corner sts. Join with sl st to first sc. 504 sc. 2nd rnd: (eyelet rnd). Ch 6 (counts as dc and ch 3). Miss marked st. 1 dc in next sc. *Ch 3. Miss next 3 sc. 1 dc in next sc. Rep from * to marked st. Ch 3. Miss marked st. 1 dc in next sc. Rep from * around. Join with sl st to 3rd ch of ch 6. 3rd rnd: Sl st in first ch-3 sp. [Ch 3. (Yoh and draw up a loop. Yoh and draw through 2 loops on hook) twice. Yoh and draw through all loops on hook - Beg CL made. Ch 2. CL] in same ch-3 sp. *Ch 3. 1 sc in next ch-3 sp. Ch 3. (CL. Ch 2. CL) in next ch-3 sp. Rep from * around. Join with sl st to top of Beg CL. 4th rnd: Ch 3. Beg CL in same sp as sl st. Ch 2. CL in next ch-2 sp. Ch 2. CL in next CL. *Ch 3. 1 sc in next sc. Ch 3. CL in next CL. Ch 2. CL in next ch-2 sp. Ch 2. CL in next CL. Rep from * around. Join with sl st to top of Beg CL. Fasten off. Weave ribbon through eyelet rnd of Lace Border. This blanket is so stunning. 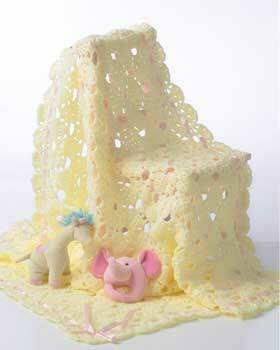 The lacy fabric makes it nice and light and perfect for a baby shower gift. Though really you could switch the color, just keep crocheting, and I could see this being a fantastic throw for my couch. WARNING- NEVER weave a length of ribbon around the edge of a baby blanket unless you then sew it down every 2 inches!!! The baby can become entangled in a pulled ribbon, making it a strangulation hazard. We almost lot our first daughter to just such a blanket ribbon, had I not decided to check on her "just one more time" before we went to bed ourselves. Sure enough, the ribbon was tangled and twisted around her neck! Thank God for guardian angels. I consider myself an advanced crocheter, BUT I am not a designer and I am NOT a mind reader. I want to love this blanket but after crocheting and yanking out and crocheting some more I'm done with this one. I don't think the pattern is difficult, just poorly written. I've pinned this blanket. Thanks for having the pattern right in front.Easier for crocheters. I've made this blanket twice and had the same error problem reported by dinasthomas, but figured it out. Both blankets were given to new mothers of baby girls and repeatedly I am stopped to thank me again, because their little one's LOVED their blanket. I ALWAYS make a lacy blanket for babies. They are fascinated by the texture and it's very soothing for them. Thanks for the inspiration. I will make this blanket after this current project I have. I can't wait to make this for my friend's baby shower! this is NOT a good pattern for a baby blanket-too many holes for fingers and toes! I loved this so much that I'm making it for myself using regular Bernat as a lap blanket as well as a baby blanket with Bernat Baby. HOWEVER, there is an error in the pattern, which I found after ripping out row 6 several times. 6th row: Ch 4 (counts as tr). 2 dc in next ch-2 sp. *1 dc in next CL. Ch 3. Miss next 3 dc. 1 dc in next CL. [(2 dc in next ch-2 sp. 1 dc in next CL) twice. Ch 3. Miss next 3 dc] 10 times. 1 dc in last CL. 2 dc in next ch-2 sp. Miss next tr. 1 tr in top of turning ch 4. Turn. The line SHOULD read as follows: 6th row: Ch 4 (counts as tr). 2 dc in next ch-2 sp. *1 dc in next CL. Ch 3. Miss next 3 dc. [1 dc in next CL. (2 dc in next ch-2 sp. 1 dc in next CL) twice. Ch 3. Miss next 3 dc] 10 times. 1 dc in last CL. 2 dc in next ch-2 sp. Miss next tr. 1 tr in top of turning ch 4. Turn. the beginning bracket of the repeat stitches is in the wrong place.